Trails for all! Trails for Adoption! Much of the ongoing maintenance, improvements, reroutes, and upgrades to our trail system happen because of our generous Trail Adoption Plan supporters. Thank-you! We are extremely grateful for the contributions of our past and present TAP sponsors. In 2017, TAP contributed 105 trail days, close to 10,000 volunteer hours, and $84,000 to our trail network! 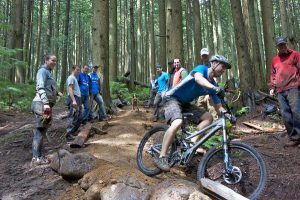 This is a unique sponsorship opportunity for any business: Get your employees out into the forest together for a valuable team building experience; gain recognition for your brand as a positive and generous contributor to the mountain trails community; give back to the sport of mountain biking and help us fund Youth initiatives and stewardship / educational experiences. As a $3000 or $5000 TAP sponsor, your business logo will be proudly displayed at the trailhead for the year and your logo will have a prominent place on our website and newsletter. There are still a number of trails available for adoption for 2018! With our newly signed agreement with CMHC and RSTBC, there are more opportunities than ever, and we need support from our community. Contact us for the options and to discuss what might be the most meaningful and impactful way for your organization to get involved and contribute to the trails. With 28 trails already committed to be adopted for 2018, this program has been incredibly successful and continues to grow. This is a great time to work together with our trail builders and our amazing community! Please email cynthia@nsmba.ca to find adoption opportunities. Also check out nsmba.ca/become-a-sponsor for other sponsorship opportunities.